Racine, Wisconsin. In 1949, 0 & H Danish Bakery was founded by Christian Olesen in the home to one of the largest Danish populations in the United States. One of thousands who immigrated here from Denmark, Chris brought with him the "Old World" Danish pride and commitment to quality that have become 0 & H Danish Bakery hallmarks. Loved by those who long for wonderful baked goods reminiscent of old Denmark, 0 & H Danish Bakery became masters of the Danish Kringle. Over the years, a strong sense of family commitment evolved, as the extended family devoted their time and energy to produce the finest, authentic Danish Bakery in the country. The wonderful aroma of fresh-baked breads, Kringle, cinnamon rolls, pies, cakes, cookies, and a host of other delicious bakery fill the air throughout the neighborhood. Today, the fourth generation of Olesens is entering the family business. 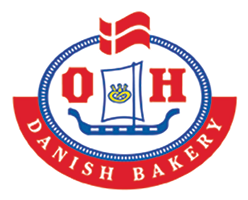 Read "A History of Kringle With O&H Danish Bakery" on the Sconnie Days blog!